on virtually anything Walmart sells. Earn 1.25% at Walmart stores and on Walmart.ca1. Redeem* at the register or online with as little as $5 in Walmart Reward Dollars™ or save up for something special. Free supplementary cards so you can earn rewards faster. See how Walmart Reward DollarsTM add up quickly. Simply use our rewards calculator to see how many Walmart Reward DollarsTM you’ll earn each month. * Walmart Reward Dollars™ are redeemable for savings on future purchases made online at Walmart.ca and at Walmart stores in Canada only. Walmart Reward Dollars cannot be redeemed for cash and cannot be redeemed for more than the equivalent dollar value of your purchase. To redeem your Walmart Reward Dollars, you must redeem a minimum of $5.00. If you wish to redeem more than $5.00 worth of Walmart Reward Dollars, you must do so in $5.00 increments. Other conditions, restrictions and exclusions apply. See Walmart Reward Dollars Program Terms and Conditions for details. 1 Earn 1.25% of dollars spent in our stores means Walmart stores in Canada and walmart.ca before taxes. Some exclusions apply. See Walmart Reward Dollars Program Terms and Conditions for details. † Bonus Walmart Reward Dollars (a $15 redemption value) will be awarded to your Walmart Rewards account within five business days of making two qualifying purchases using your Walmart Rewards™ Mastercard®, one purchase at a Walmart store in Canada or online at Walmart.ca and one purchase at another location anywhere Mastercard® is accepted. Both purchases must be made within 30 days of receiving your Walmart Rewards™ Mastercard®. Only one bonus will be awarded per account. Bonus Walmart Reward Dollars (a $10 redemption value) will be awarded to your Walmart Rewards account within two statement periods after you sign up for electronic statements. Only one paperless bonus awarded per account. These offers are also subject to the full Walmart Reward Dollars Program Terms and Conditions. 2 Walmart Reward Dollars are not earned on these products. See Walmart Reward Dollars Program Terms and Conditions for details. ◊ Enrollment in the Balance Protection Plan (BPP) is optional. If you cancel within 30 days, any premiums that have been billed to you will be refunded and your coverage will be void. You may also cancel at any time. The BPP premium (which is calculated at the rate of $0.95 per $100 of your monthly statement balance), plus applicable taxes, will be charged to your Walmart Rewards Mastercard® account, if you have a monthly statement balance of $25 or more at the time your statement prints. BPP is underwritten by The Canada Life Assurance Company. See Balance Protection Plan Disclosures for details. ‡ Enrollment in the Extended Warranty Plan (EWP) is optional. If you cancel within 30 days, any warranty fees that have been billed to you will be refunded and your coverage will be void. You may also cancel at any time. EWP is only available in the provinces or territories of Alberta, Manitoba, Ontario, Prince Edward Island, Northwest Territories and Nunavut. The EWP warranty fee (which is $3.99 a month), plus applicable taxes, will be charged to your Walmart Rewards Mastercard account, if you have a monthly statement balance of $25 or more at the time your statement prints. EWP is provided and administered by Asurion Consumer Solutions of Canada Corp. EWP is not an insurance product and is not underwritten by an insurance company. See Extended Warranty Plan Disclosures for details. ∞Free upon redemption of sufficient earned Walmart Reward Dollars, redeemable for future purchases made online at Walmart.ca and at Walmart stores in Canada only. Conditions, restrictions and exclusions apply. See Walmart Rewards Program Terms and Conditions for details. ∆ "Instant Approval",“Shopping instantly” or “Shop instantly” refers to the ability to use your new Walmart Rewards Mastercard for purchases on Walmart.ca immediately after your online application approval, via a temporary shopping pass without having to wait for your new Walmart Rewards Mastercard to arrive in the mail. Your temporary shopping pass will automatically appear as a payment option when you checkout and will be valid until 11:59pm Eastern Standard Time (EST) on the date of your approval, and will be limited to an amount as determined by Duo Bank of Canada. Your Walmart Rewards Mastercard application may still be approved without the issuance of a temporary shopping pass. 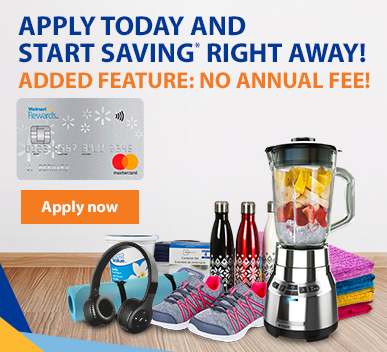 Any purchase(s) made on Walmart.ca using the temporary shopping pass will appear on your first Walmart Rewards Mastercard statement and will require repayment in accordance with the terms of the Walmart Rewards Mastercard Cardholder Agreement. The Walmart Rewards Mastercard® is issued by Duo Bank of Canada. All Walmart trademarks are the property of Walmart Apollo, LLC, and are used by Duo Bank of Canada under license. ®/TM - Mastercard and the Mastercard Brand Mark, Tap & Go, SecureCode and Priceless Cities are registered trademarks and the circles design is a trademark of Mastercard International Incorporated. Please call us at 1.888.331.6133, TTY 1.877.763.0997. Call us immediately at 1.888.925.6218 within Canada and the US or call us collect at 1.647.788.2929 if outside of Canada and the US. Mon. – Sat. 8am – 12am EST.